Examples of ‘inorganic benzene’ are pretty rare. 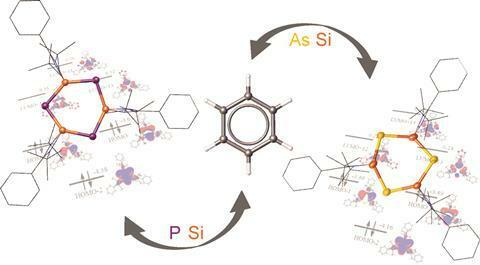 But a team of scientists from Germany and Russia has now synthesised a ring molecule containing only silicon and either arsenic or phosphorus. Since August Kekulé first dreamt up benzene’s structure in 1865, chemists have been tinkering with its distinct ring of six carbon atoms. The first inorganic benzene molecule, borazine, was synthesised back in 1926. But, even though chemists can readily swap one or two carbon atoms out, examples of inorganic analogues of benzene are scarce. Andreas Seitz from the University of Regensburg, Germany, and his colleagues have now added two other inorganic benzene rings to this small collection, after making both triarsatrisilabenzene and triphosphatrisilabenzene. The team created the analogues of benzene by reacting a zirconium-based compound containing either arsenic or phosphorus with monochlorosilylene in toluene. Both molecules’ aromatic character was confirmed via density functional theory calculations.